Permanent cosmetics are an innovative and revolutionary artistic technique also known as micro pigmentation or cosmetic tattooing. This artistic enhancement consists of implanting natural pigments under the superficial layers of the skin. Using a small sterile micro-needle, the natural pigments are inserted between the dermis and the epidermis, creating a lasting cosmetic effect. This highly skilled technique reflects a visual illusion where hair or colour is missing in the following areas: eyebrows, eyeliner/or giving the look of fuller, thicker eyelashes. This technique is very useful in providing colour in areas of the lip’s where natural colouring of the mouth area is missing. Permanent makeup is cosmetic tattooing. There are many titles used to describe the services, but the service is tattooing. You will find permanent cosmetics, permanent makeup, cosmetic tattooing and micro-pigmentation being the top descriptors utilized. 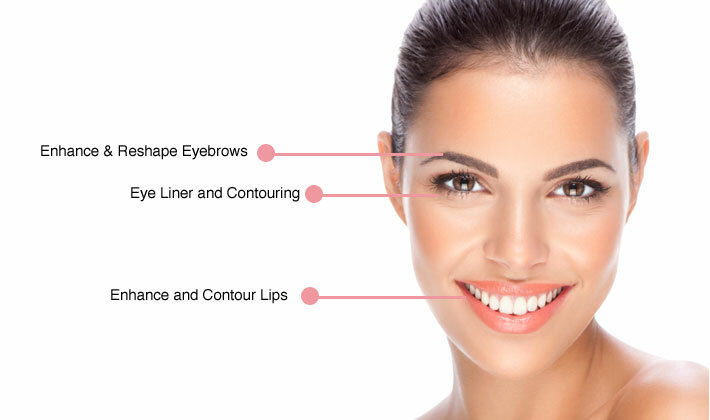 Permanent makeup is designed for people who are tired of pencilling in their eyebrows, lip lines and eye liner. It’s for people who are too busy or no longer wish to engage in the tedious and time-consuming task of getting your eye shadow or lipstick just right every single morning. If that’s the case, it’s within your grasp to wake up each day, with a photo-ready face that says you’re ready for your close up. At Dermedix Clinic, we specialize in the fine artistry of permanent tattooed makeovers. Whether you want a more subtle or natural looking image or you prefer a look that is more bold and dramatic, our professionals can work with you to customize a something that is truly your own. We also offer permanent makeup services to disguise scars or white spots on the body caused by vitiligo or to pigment the areola post-surgery or for other reasons. 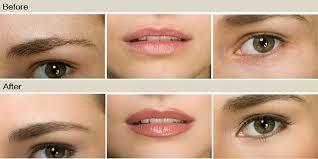 The amazing thing about Permanent Makeup is that it is beneficial for almost everyone. Today there is an increasing number of men and women who choose to undergo the tattooing process in its various forms. For some, it is an aesthetic choice or an initiation rite. Some use permanent makeup as a time saver or because they have physical difficulty when applying regular, temporary makeup. For others, tattooing is an adjunct to reconstructive surgery, particularly of the face or breast, to simulate natural pigmentation. People who have lost their eyebrows due to alopecia (a form of hair loss) may choose to have “eyebrows” tattooed on, while people with vitiligo (a lack of pigmentation in areas of the skin) may try tattooing to help camouflage the condition. Is there any healing time to Permanent Makeup? When scheduling an appointment date for a permanent make-up procedure, keep in mind the healing time of the procedure. You will need a few days afterwards without social plans or strenuous activity. You will not look your best (swelling, oozing, & looks like wet paint) so plan activities around the house. Plan a shopping trip ahead of time for items you will need: ointments, straws, napkins for blotting, Q-tips, OTC pain reliever, prescriptions, a good book or movies. Get ahead on your dirty work – no lawn mowing or chores that will get dirt/ bacteria on the healing area. Can I have Permanent Makeup done before I go on a vacation trip? Do not have a procedure right before going on vacation because 1) you need healing time – you will not look like you had a makeover at the mall, 2) you may not be able to avoid sun, wind, or other items listed in post-care instructions, 3) if you had a question or permanent make-up problem it would be best to be near your permanent make-up artist and local physician. Do I get sedated when I have the procedure done? Can there be a healing problem with Permanent Makeup? Permanent eyebrow swelling is mild and barely noticeable. Permanent eyeliner swelling is moderate. Permanent lip color swelling is severe. It is rare to have a healing problem with permanent makeup eyebrows or eyeliner. If there is going to be a permanent makeup problem, it will be with the lips. Two unpleasant lip complications are Candida infections and hyper-pigmentation. These two permanent makeup problems can fool permanent makeup artists and doctors, resulting in not getting the best treatment for the type of problem that it is. • Do not wear contact lens during the procedure or for 24 hrs after. • Bring sunglasses to wear home. Eyes may be light sensitive. • Do not use eyelash curler the day of the procedure. • If you have had any type of eye surgery, consult with the physician about how long you should wait before having a permanent eye-liner procedure. Most physicians are giving a 2 month OK after cataract, lasik, and blepharoplasty. • Do not tweeze, wax, or dye brows for 2 days prior. • Electrolysis should not be done for a week prior. • If you get cold sores you will need an antiviral prescription. Physician usually instructs to begin taking it 3 days before procedure, for a 7-10 day course. • If you have had any type of lip surgery, consult with the physician about how long you should wait before having a permanent make-up procedure on the lips. Most physicians are giving a 3 week OK after lip filler injections like collagen or Restylane. Permanent make-up artists have noticed poor colour retention in lips that have received collagen injections within the previous 6 months, longer for restylane. There has even been a little pigment migration along lip edges with Restylane. It may be best not to have lip filler injections and permanent lip colour within the same year. If the lip surgery involves an incision (like a lip implant), the incision needs to mature about 6 months before tattooing on top of it. • Oral prosthesis dentures/ partials/ braces and tongue piercing bars may increase risk of getting bacterial and/or fungal infection from the mouth to the lips. Frequent or recent sinus infection puts lips at risk of infection. What do I need to know about the healing time? Permanent makeup will appear extremely intense and thick immediately after the procedure. The color will not even look right the first few days. Other factors are added to the permanent makeup pigment bottles to counteract the undertones of facial skin. Browns can look orangish-brown, blonde brows may look too yellow, lip colors are shocking! Some colors initially look too bright and others look too dark. But don’t worry – it changes. Excess pigment sheds off over the next 2-3 days, and then the skin starts healing over. A layer of healed skin on top of the pigment masks and tones it down considerably. As swelling goes down the lines will be thinner. On about the fourth day you are close to looking normal and no one notices anything. Colors will continue to soften over the next few weeks. It will look very natural in 2-3 months. You see another difference around the 7-9 month time period. It looks even softer and lighter. Brows and lips that looked fine at 2-3 months may have faint areas or be too light after 7-9 months. Because it can take up to a year to know if you need a touchup. How long will I need to rest after my Permanent Makeup procedure?